One thing we know about cancer cells: they can resist death. They evade apoptosis, the mechanism that programs cell death once cells become damaged. Normally, apoptosis helps keep an organism healthy through growth and development, maintaining body tissue by removing infected or damaged cells. But cancer cells do not follow this process, no matter how abnormally they grow. The cancer cells may alter the mechanisms that detect the damage or irregularities, preventing proper signaling and apoptosis activation. Cancer cells may also introduce defects in the downstream signaling itself, or the proteins involved in apoptosis, which would also prevent proper apoptosis (1,2). Apoptosis is also significant in the Hallmark Evading Growth Suppressors, but that refers to apoptosis triggered by external signals. With this Hallmark, we’re referring to intrinsic apoptosis, in which the apoptotic program never begins. To discover how cancer cells evade cell death, we must first investigate the different pathways through which Apoptosis may occur. Apoptosis can be induced through the activation of Death Receptors. Caspase-8: apoptosis is induced through several receptors that activate caspase-8 and lead to the release of the caspase-8 active fragments, which then cleave and activate downstream caspases. RIP kinases: (near the receptors in this pathway) are important regulators of cellular stress that trigger pro-survival and inflammatory responses through the activation of NF-kB, as well as pro-apoptotic pathways. Bcl-2: exerts a survival function in response to a wide range of apoptotic stimuli through inhibition of mitochondrial cytochrome c release. p53: the "master switch," a tumor suppressor protein that plays a major role in cellular response to DNA damage and other genomic aberrations. Activation of p53 can lead to either cell cycle arrest and DNA repair or to apoptosis. p53 can be phosphorylated and acetylated at multiple sites by a number of proteins, including Chk2 and ATM. 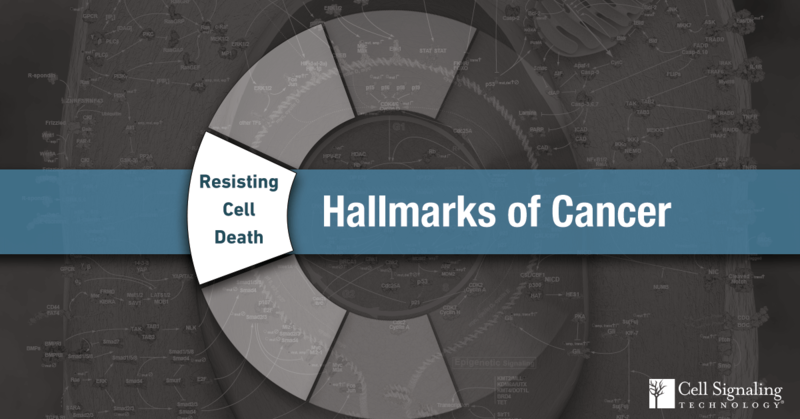 Learn more about Resisting Cell Death. The Hallmarks of Cancer are seminal manuscripts by Doctors Robert Weinberg and Douglas Hanahan and were published in Cell1. The authors proposed the idea that the complexity of cancer can be broken down into smaller subsets of underlying principles. The information here pertains to one Hallmark of Cancer, known as "Resisting Cell Death." Other entries in this series explore the other proposed Hallmarks.